This year saw the start of Wayne Gretzky's tenure with the Los Angeles Kings, having been traded in the off-season after leading the Edmonton Oilers to the 1988 Stanley Cup. Coinciding with Gretzky's acquisition, the team also changed its uniforms and colours for 1988–89, scrapping the purple and gold associated with its co-tenant at the Great Western Forum, the NBA's Los Angeles Lakers, in favour of black and silver. Gretzky's presence signaled a dramatic on-ice turnaround for the Kings. Prior to his arrival via trade with the Edmonton Oilers on August 9, 1988, Los Angeles had the fourth-worst record in the NHL at 30 wins, 42 losses, and 8 ties. After Gretzky's first season with the Kings, however, they moved all the way up to fourth-best in the NHL, with a record of 42 wins, 31 losses, and 7 ties for 91 points. They also managed to defeat Gretzky's former team, the Oilers, in seven games in the Smythe Division Semifinal before falling victim to a four-game sweep at the hands of the eventual Cup champion Flames in the Division Final. Mario Lemieux of the Pittsburgh Penguins won the Art Ross Trophy for the second consecutive season, leading the league with 199 points. Lemieux remains the only player other than Gretzky to approach the 200 point plateau (Gretzky surpassed the 200 point mark four times in five years during the 1980s). This was the only season that there were four players that scored 150 or more points; Gretzky tallied 168, while Steve Yzerman and Bernie Nicholls totalled 155 and 150 points, respectively. This was also the only time that two teammates, Gretzky and Nicholls of the Los Angeles Kings, had hit the 150 point mark. Narrowly edging out Lemieux, Gretzky won his ninth Hart Memorial Trophy as the league's MVP, while Yzerman finished third in the balloting. Yzerman was voted by his fellow players as the NHLPA MVP, taking the Lester B. Pearson Award. New York Rangers rookie Brian Leetch broke the record for goals by a rookie defenceman with 23. He finished that season with 71 points and easily captured the Calder Memorial Trophy. On March 22, an incident took place in Buffalo during a game between the Buffalo Sabres and the St. Louis Blues. During a goalmouth collision between the Blues' Steve Tuttle and the Sabres' Uwe Krupp, Tuttle's skate blade slashed the throat of Buffalo goaltender Clint Malarchuk, severing the latter's jugular vein. Thanks to some timely action by Sabres trainer and former US Army Vietnam War veteran Jim Pizzutelli, Malarchuk quickly received treatment and was released from the hospital the next day. He returned to action 10 days later. This was the first season that every NHL arena had full rink board advertisements. Note: Teams that qualified for the playoffs are highlighted in bold. The 1989 Stanley Cup Final featured two Canadian hockey teams, the Montreal Canadiens and the Calgary Flames. Montreal finished the regular season with 115 points, only two behind the league leader Calgary. They had last faced each other only three years earlier, with Montreal winning a five-game series in 1986. 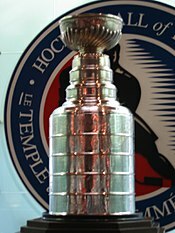 Calgary was only the second opposing team in NHL history to win a Stanley Cup at the Montreal Forum (the New York Rangers defeated the Montreal Maroons in 1928) and the first to do so against the Canadiens, marking the first time since 1983 that the Stanley Cup wasn't awarded in the province of Alberta. The Stanley Cup Finals was decided between the top two teams during the 1988–89 NHL regular season. Captain Lanny McDonald scored the second Flames goal in Game 6. This turned out to be the last goal in his Hockey Hall of Fame career as he retired during the following off-season. Doug Gilmour scored two goals in the third period, including the eventual game and Cup winner to cement the victory for the Flames. Ron Hextall, Philadelphia Flyers, First goaltender to score a goal in post-season. Trading deadline: March 7, 1989. February 27, 1989: Peter Deboer traded from Toronto to Vancouver for Paul Lawless. March 4, 1989: Perry Berezan and Shane Churla traded from Calgary to Minnesota for Brian MacLellan and Minnesota's fourth round choice in 1989 Entry Draft. March 6, 1989: Ken Wregget traded from Toronto to Philadelphia for future considerations. March 7, 1989: Clint Malarchuk, Grant Ledyard and Washington's sixth round pick in 1991 Entry Draft traded from Washington to Buffalo for Calle Johansson and Buffalo's second round pick in 1989 Entry Draft. March 7, 1989: Jim Pavese traded from Detroit to Hartford for Torrie Robertson. March 7, 1989: Lindy Ruff traded from Buffalo to NY Rangers for NY Rangers' fifth round pick in 1990 Entry Draft. March 7, 1989: Reed Larson traded from NY Islanders to Minnesota for future considerations. March 7, 1989: Claude Vilgrain traded from Vancouver to New Jersey for Tim Lenardon. March 7, 1989: Brian Wilk and John English traded from Los Angeles to Edmonton for Jim Wiemer and Alan May. March 7, 1989: Greg Gilbert traded from NY Islanders to Chicago for Chicago's fifth round pick in 1989 Entry Draft. March 7, 1989: Washington Capitals obtain Dino Ciccarelli and Bob Rouse from the Minnesota North Stars for Mike Gartner and Larry Murphy. March 7, 1989: Jean Leblanc and Vancouver's fifth round pick in 1989 Entry Draft traded from Vancouver to Edmonton for Doug Smith and Greg C. Adams. ^ a b c d Dinger, Ralph, ed. (2011). The National Hockey League Official Guide & Record Book 2012. Dan Diamond & Associates. p. 153. ISBN 9781894801225. ^ Dinger 2011, p. 153.